So, my dry cleaner may or may not have a crush on my husband. It all started back around Halloween. He went downstairs to pick up our clothes and came back with them-- and a caramel apple. Then a few weeks ago, it was an enormous Asian pear. I ran into her last week and she gave me a gift to pass on to Alex: 20 Korean dumplings and another Asian pear. This was, by far, the best gift yet... and whether she is crushing on him or not, the dumplings can keep coming! Truthfully, she is a sweet little grandmotherly lady who just adores Alex's goofy disposition. And she is responsible for introducing me to the Asian pear. I have often seen them in the produce department, but have never bought one. With two on my hands, I figured it was time to do something with them. The Asian pear is rounder in shape than American pears, but the flavor is all pear. The fruit is a bit tougher and more grainy than the varieties of pear that we are used to in the U.S., so they aren't typically used for baking. I, however, liked the idea of baking with Asian pears since they would keep a firmer less mushy texture throughout the baking process. 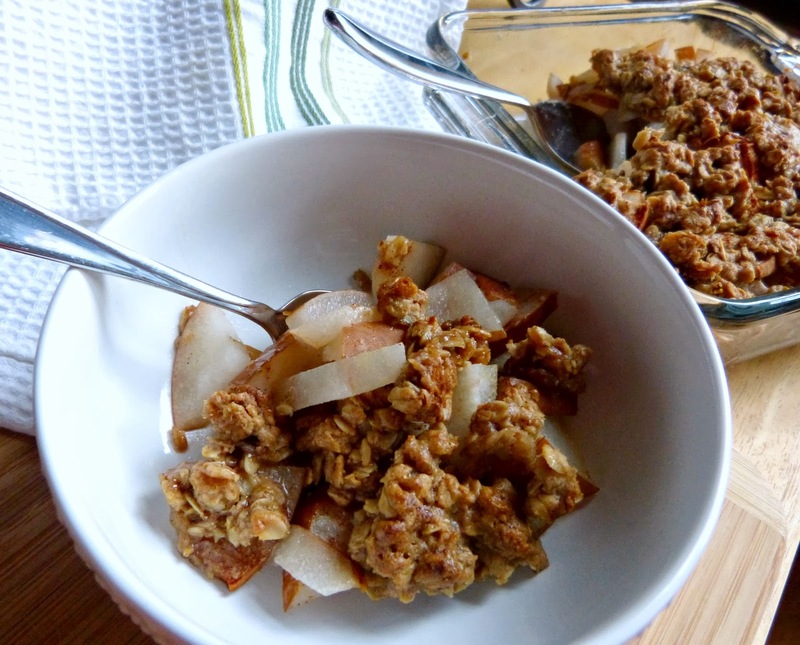 This oatmeal cookie crisp is a variation of my super easy go to fruit crisp recipe. It comes together in only a few minutes with a great cinnamon and brown sugar flavor-- with a hint of maple. And instead of a crumbly texture, this crisp becomes a chewy crust when it bakes and it reminds me very much of a homemade oatmeal cookie. 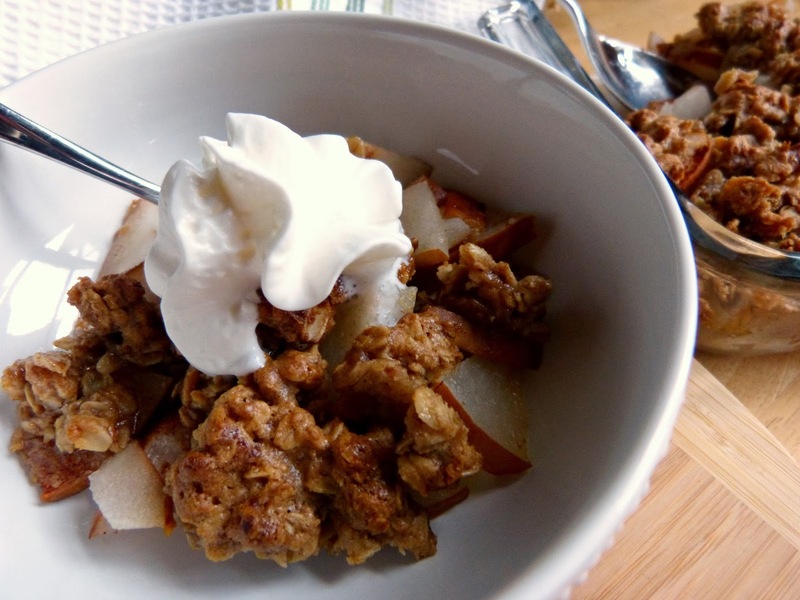 On top of the sweet crisp pears and served with vanilla ice cream or a little whipped cream, this is a delicious and simple dessert that you can serve to guests or whip up on whim like I did. This crisp can be made year round with a variety of fruits. Apples are my favorite to use, but I have also tried it with peaches, plums, and even raspberries. Typically I peel the fruit before slicing and baking it, but this time around I left the skins on for a more rustic look and texture. Preheat oven to 375 degrees. Combine pears and lemon juice and spread out in an even layer in a 8x8 baking dish. In a small bowl stir together flour, oats, brown sugar, maple syrup, cinnamon, and butter until well combined and a thick batter is formed. Drop the batter in spoonfuls over the top of the pears. 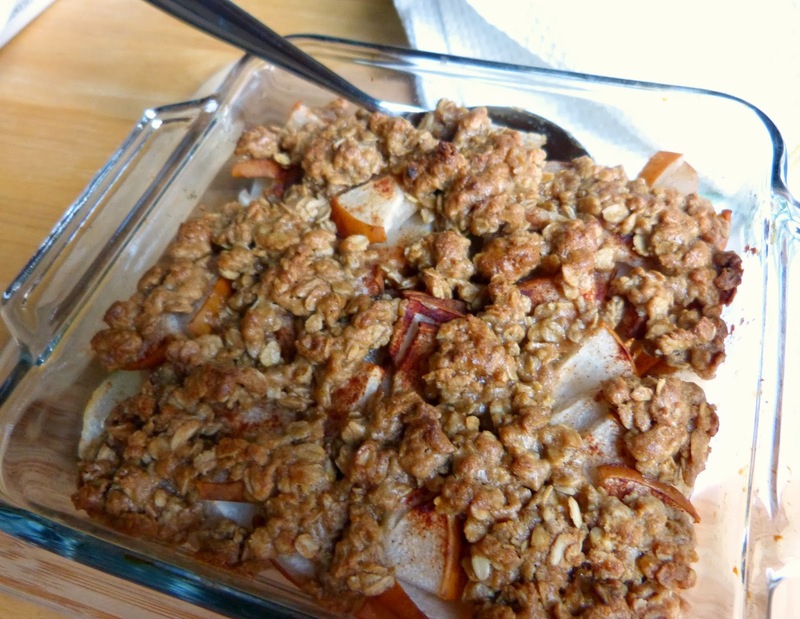 Bake for 25-30 minutes until top is golden brown and fruit begins to bubble around the edges.